Transports Fatty Acids* Boosts Cellular Energy* Acetyl-L-Carnitine (ALC) is a modified amino acid that supports cellular energy production by assisting in the transport of fat into the mitochondria where it is converted into ATP (cellular fuel). * ALC is a highly bioavailable form of L-Carnitine that can cross the blood-brain barrier, where it helps to manage oxidative damage, supports mitochondrial function and helps to maintain normal neurotransmitter activity. * Clinical studies suggest that ALC helps to maintain optimal neurological health. * Natural color variation may occur in this product. Take 1-2 capsules 1 to 3 times daily as needed. Store in a cool, dry place after opening. Supplement Facts Serving Size: 2 Veg Capsules Servings Per Container: 25 Description Amount per Serving % Daily Value * Daily Value not established. 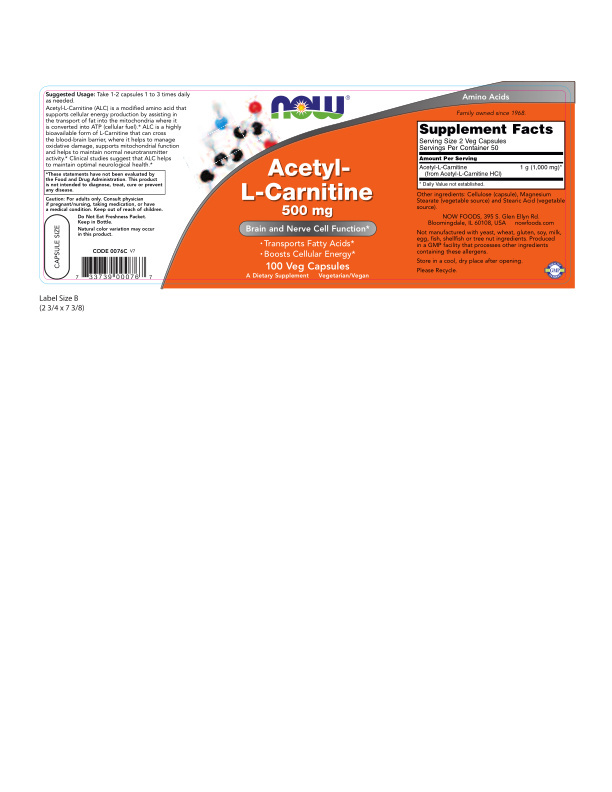 Acetyl-L-Carnitine (from Acetyl-L-Carnitine HCl) 1 g (1,000 mg) * Other Ingredients: Cellulose (capsule), Magnesium Stearate (vegetable source) and Stearic Acid (vegetable source). Not manufactured with yeast, wheat, gluten, soy, milk, egg, fish, shellfish or tree nut ingredients. Produced in a GMP facility that processes other ingredients containing these allergens. Caution: For adults only. Consult physician if pregnant/nursing, taking medication, or have a medical condition. Keep out of reach of children. Do Not Eat Freshness Packet. Keep in Bottle. Natural color variation may occur in this product. Store in a cool, dry place after opening. Please Recycle. Vegetarian/Vegan. Family owned since 1968. For adults only. Consult physician if pregnant/nursing, taking medication, or have a medical condition. Keep out of reach of children. Do not eat freshness packet. Keep in bottle.